The Montebello State Fish Hatchery is the smallest of the VDGIF facilities, but it still produces an important portion of the total output. 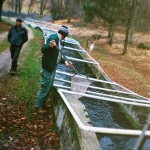 The facility engages in trout production, from fingerlings to stocking sizes. Along with 4 other Virginia coldwater facilities, over a million trout are reared to stocking size each year. Located near the Blue Ridge Parkway, Montebello is one of the most popular sites for visitors. Montebello, Virginia trout go to all the trout waters east of the Blue Ridge, from Amherst County, north. Summer (April 1 – October 31): Daily 8AM – 3:30PM, including weekends and holidays. Winter: (Nov. 1 – March 31) Monday-Friday 8am – 3:30 pm and Weekends/Holidays from 8am-11am.